Pair with the Chocolate Buttermilk Cake and Edible Chocolate Roses, from the Altitude Adjustments article in the February 2017 issue. This classic ganache works the same at all altitudes. Makes 2–3 cups. Combine the chocolate and cream in the top of a double boiler set over simmering water (sea level to 3,000 feet) or boiling water (5,000 feet and above) and heat, stirring occasionally, until smooth. Remove from heat, set aside to cool. Whisk the flavoring into the chocolate. If using a glass double boiler, transfer the mixture to a metal bowl. Prepare an ice-water bath and set the bowl in it. Beat with a handheld electric mixer for a few minutes or until the icing is cool, lighter in color, and nearly doubled in volume. It should be thick, creamy, and of spreading consistency. Add a little more cream to soften it, if necessary, or refrigerate (or freeze, wrapped in plastic wrap) to firm. Spread the icing on the cake with an icing spatula. At first you will see lots of bubbles in the icing, but as you work the spatula over the surface, the texture will smooth out. 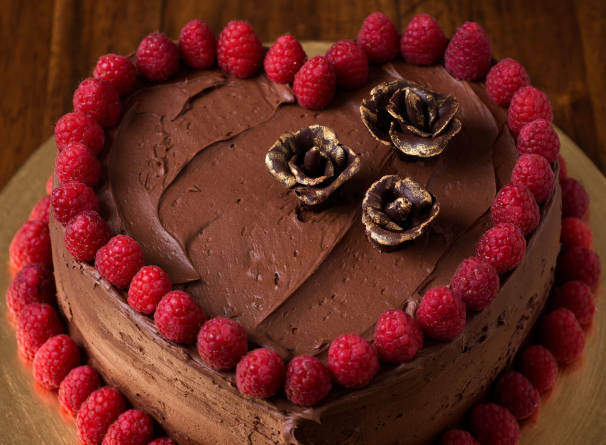 Optional: Decorate with chocolate roses. For recipe, go here.